Flying cars loomed large in most every prediction of the future since the airplane was invented, beginning in 1917 when the Curtiss Autoplane flying car was made public. Interest reached a fever pitch in the 1960s when the successful TV program, “The Jetsons,” showed George Jetson driving a 1962 animated model. Ford Motor Company even considered building the first FAA-approved flying car called the Aerocar in the 1970s. In the late 1980s, Paul Moller successfully launched the M200X. The car-like hovercraft has made 200 flights since 1989 and may be the forerunner of practical flying cars. More recently, in World of Warcraft flying gryphons (a mythical creature with wings of an eagle and the body of a lion) magically move players from point A to B. Think of flying gryphons as a kind of Uber service that appears when needed and then disappears after dropping you at your destination. In reality, a number of startup companies have gotten serious about mass-marketed flying cars. 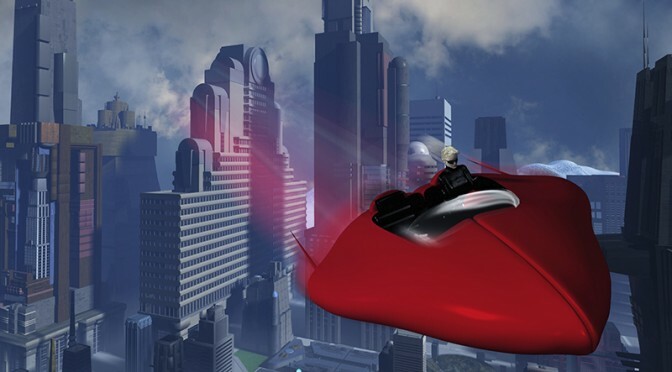 Terrafugia sells a $280,000 flying car, MACRO Industries has the SkyRider, Urban Aeronautics has its X-Hawk, and Joby Aviation is testing its “air taxi,” which aims to fly for 60 cents per mile—an operating cost that seriously competes with ground-based cars. Is the flying car making a comeback? Is it for real this time? The flying car has been promised for almost a century, but it never materialized as a mass-market product. Why not? The answer lies in computer technology—or the lack of it. Besides making cell phones possible at a consumer price point, Moore’s Law has also made automated vehicles possible at a consumer price point. Flying cars are now reaching acceptable consumer prices and capabilities because of PID control algorithms, lightweight sensor-laden computing, hyper-accurate GPS positioning, battery technology derived from the portable laptop market, and crash-avoidant driver-less technology. These technologies have come together at the right time and right consumer price to make robots, cars, and flying things practical. Large numbers of commuters will never be able to drive their own flying cars as long as they are required to obtain a pilot’s license. And there are too few qualified pilots to launch a transportation revolution on the backs of licensed pilots. Besides, who wants to ride in a flying car driven by an unlicensed driver? But PID controllers make it possible for drones and pilotless cars to fly safely and cheaply. Driver-less PID technology is the key difference between now and 1962. It is the enabling technology inventors have been waiting for. PID (proportional-integral-derivative) controllers are at the heart of drone technology. PID controllers were first invented for guiding ships through channels with crosscurrents and delayed reacting steering mechanisms. That is, PID controllers account for drift and delays in correcting for drift, so there is not overshooting or oscillation. If you have ever driven a boat for pleasure, you know how difficult it is to steer under drift conditions and delayed reaction to your commands. Open source software already exists for PID controllers that react to sensor data onboard flying machines such as drones and driverless cars. In a drone, an accelerator provides sensor inputs to the PID software, which adjusts thrust based on the error or difference between desired position and actual position. According to Wikipedia, P is a measure of the present error, I is equal to the accumulated value of past errors (in mathematical terms this is the integral value), and D is a prediction of future errors based on current rate of change (in mathematical terms this is the derivative value). The weighted sum of these three values is used to adjust thrust by varying rotor pitch, speed, or both. A quad-copter, for example, can be made to move in any direction by altering the rotational speed of one or more rotors. The first PID controllers appeared in 1911, so the technology is not new. What has changed is the dramatic decline in cost, weight, and power needed to operate a PID controller. Of course more software has to be added to the PID software to avoid bumping into things and following a GPS path from starting lat-long to landing lat-long. But such technology already exists in any cell phone. The second major advance that is making flying cars a practical reality is the rise of hyper-accurate GPS. Drones and flying cars need highly accurate GPS coordinates in 3-D, and they need it fast. Human ingenuity in the form of real time kinematic (RTK) sensing reduces GPS accuracy from approximately one meter to one centimeter—a factor of 100. RTK compares the phase of the GPS signal’s carrier wave, rather than the information content of the signal, with a single reference station to calculate real-time lat-long positions. It is a clever hack of the GPS signal. In August 2014, Swift Navigationof San Francisco received $2.6 million in financing to manufacture a postage stamp sized RTK chip, and is currently delivering them for $495. While this is a bit pricey for cell phone use, it makes centimeter level navigation practical for drones and flying cars. Innovation is often part imitation and part novelty. In this case the confluence of old and new technologies like PID and RTK has a predictable consequence—new and unpredictable products begin to appear. What was once considered science fiction suddenly becomes science reality. But, there is a fly in the oatmeal. Will the FAA Allow Them? Regulation remains as the final challenge holding flying cars back. Currently, FAA regulations limit autonomous vehicle flights to 550 ft. above ground and 55 lbs. of weight in the U.S. The FAA also requires licensed pilots to operate the vehicle, but exceptions are being issued daily under the “333 exemption.” For example, Amazon plans to deliver packages via unmanned, un-licensed, and GPS-guided control. If Amazon can do it, the flying car is only a few years away from reality. Assuming these regulatory roadblocks are overcome or set aside. Then what? Imagine the 20 million daily commuters in the U.S. taking to the skies everyday along the most congested commuter corridors (Washington D.C., Los Angeles, San Francisco, and New York/New Jersey). Where will they go? If they follow established roadways, we may simply be replacing congested highways with congested skyways. If they chart a straight-line course between starting and ending points, the resulting chaos may overwhelm crash-avoidance technology. And, if the FAA restricts flying cars to a limited set of routes, what have we gained? And then there is still the problem of parking. Today drones are used to take pictures and follow hikers, spot irrigation mishaps in farmer’s fields, and entertain hobbyists. In a very few years from now, the 1960s future will arrive with hovering automobiles and precision guided home delivery. The flying car will have made its comeback. Previous PostCan Robots Be Trusted?Next PostAre Google and Apple About to Pivot?